Pete and Ramon hit the roundtable to talk trailers galore! The Infinity War Super Bowl spot! Venom! Solo! Jessica Jones Season 2! And of course, Deadpool 2! Was that just Terry Crews!?! DC's monsters take the comics spotlight this week, with the Swamp Thing Winter Special and Young Monsters in Love. Aspen's Portalbound earned a top spot as well. Hit the play button 'cause there's plenty more to talk about! Pete and Ramon hit the roundtable for a spoiler-free review of Wonder Woman! Her boyfriend Steve Trevor gets his own comic book. Batman (sort of) debuts on the Gotham season finale! Paybacks and God Country writer Donny Cates gives birth to the anti-Christ. Working in this psychiatric hospital doesn't sound like such a great idea in The Unsound (see what I did there?) Darth Vader gets a second series, and Iceman is just trying to get his life in order. All that and whiskey too! Hit the play button. The boys have their Wonder Woman tickets and I don't need no golden lasso to tell you they're excited! Supergirl, Arrow, Flash get the usual treatment, plus a rumor about Gotham has got Pete hopeful. Plus lots of great books this week. So grab your rosé out of the ice box, sit back and enjoy the show! Pete's buddy A.K. joins Ramon and Cheeze in the Basement this week. Stranger Comics' new Vampire Hunter D series is the talk of the table! Amazing art and a story that stays true to its character's roots, this is a Must-Read, whether you're a VHD veteran or you've never picked up a D novel, manga, or anime in your life! Trust the Basement Crew -- you'll like this one! DC's He-Man/Thundercats series keeps going strong with issue 2! It's every 80s kid's dream come true to see all their favorite cartoon characters finally interacting! It's a full house at the roundtable this week! Hannah from 8-Bit Bakeshop joins Trish, Rich, and Cheezeburger as they get ready to watch their buddy Pete eat the hottest pepper ever spat out of the Earth and scorch the innards of anyone stupid enough to ingest it: The Carolina Reaper! Yup - Pete's at it again with one of his crazy stunts! Even Ramon swings by to watch the insanity! And this episode needs all the help it can get, cause this week's comics left the Basement Crew with much to be desired. Voltron on Netflix comes out swinging! Pete and Ramon binge and give a full review. Civil War II and D.C. Rebirth are in full effect. But will they get high marks from the Basement? Pete FINALLY finishes Locke and Key. We fill in the blanks on David Carus' adult coloring book Artists Run This Planet. Plus megatons of BOMBS from THE SHADOW! 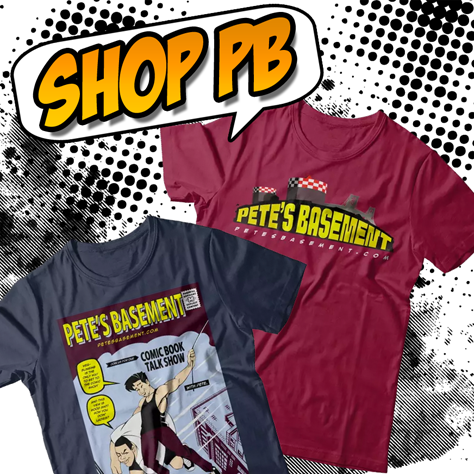 We've got just what you need, grown-up comic book talk and whiskey, so grab your glass, put the kids to bed, and join the Pete's Basement party! Adam makes a triumphant and boisterous return to the roundtable this week! DC: Rebirth and DC TV's season finales are the major topics of discussion...or should I say argument? Who liked Arrow? Who liked Flash? Does anybody still like Gotham?? And what's the deal with Captain America? How does the Basement Crew feel about Cap being a turncoat? All that, and Scooby Doo too! What are you waiting for? Hit the play button! Daredevil Season 2 hits Netflix and Jon Bernthal's Punisher is the talk of the town! Get inside Frank Castle's head as Pete, one of his biggest fans, speculates on how the man thinks, his motivations, his limits, and generally what makes him tick. Spider-Man: Dead No More has Pete and Rich flipping their lids, and Civil War II seems like deja'vu all over again. Where have we heard this story before? Plenty more comics, and more tasty treats from 8-Bit Bake Shop! Rocket scientist Chris Craddock and ninjutsu master John Maguire sit in at the comic book round table. Everyone's excited for Deadpool. We have fresh rumors about who Zoom is on Flash. Pete is enjoying Supergirl. Ash vs Evil Dead is awesome! Lots of your questions get answered, plus we have 50 lbs of comics to talk about in this jam packed two-part episode!